Welcome to the inaugural edition of the Crescent magazine. This student magazine is the newest addition to the media at Southern Connecticut State University. The development process has spanned more than two years, and began with a small group of writers who thought there was room on campus for a different style of reporting, writing and for more photographic coverage and page layouts. With the support of the Southern Media Board, the magazine reached out to all segments of the Owl population, pulling together a staff from Journalism, English, Communication and Studio Art to work its way through the creative process of starting a magazine. The opportunity to bring students from different majors, interests and talents together to create a new publication for our friends and peers was as challenging as it was gratifying. There were many deadlines we thought we could meet, and didn’t, because we needed to decide the style, fonts and overall look, as well as stories to tell and photos to take. Then we started working on magazine design. The resulting publication spans this academic year. Some students have graduated or transferred, but most are here and thriving at Southern. Despite all the work, it was a fun and creative process. While it took some time to gather all the approvals, design and produce it, we feel this new media on campus will give more students an opportunity to be involved, and the perfect place to apply their skills and to learn new ones. It is also a publication we hope will not sit on some shelf. We hope you’ll share it with others. Its vibrant photos, audio and video, as we build our new website, give Southern students stories that not only inform and entertain, but also take on life. Beyond being Owls, we are people. People who have stories to tell. We hope Crescent will now be a publication to tell those stories. It is like an open letter from students to students about students whether commuters or living in the residence halls. Whether you started here as a freshman or transferred later, you are part of the same community. We really want to thank everyone who participated through interviews, contributing stories and photos. We especially want to thank our advisers Profs. Cindy Simoneau, Vern Williams and Jodie Gil from the Journalism Department. Each has spent many, many hours with us teaching us how to create, plan, edit and design a magazine. They were willing to share their expertise and experience with us to help make this a success. Like any creators, we have hopes and expectations. We hope you find a story that opens your eyes, that stimulates you or just makes you smile. We hope you read it and decide that you want to get involved. 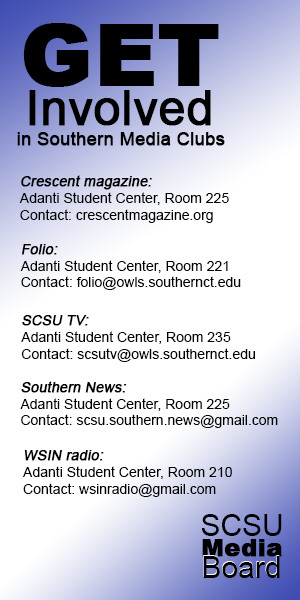 But, more importantly, we hope you enjoy it and that you look forward to the next issue of Crescent next semester.